SPECIAL CHRISTMAS DEAL - Usually 9.97, today just 2.97 - Save £7! Traditionally given as a gift at Christmas, many people are now experiencing the wonder of these blooms throughout the year. For example, you'll want a few of these to grow for a table display if you're planning a dinner party in a few weeks time. Your guests will view them in wonder, and will potentially be jealous that they have none of their own! Of course, you could simply buy them as a lovely present, it's couldn't be easier for the recipient to grow - even those without green fingers. Each complete gift boxed growing kit contains a large bulb and simple instructions - everything needed to grow these beautiful flowers. We have stocks of large bulbs to provide an unusual and bold display of glorious colour in your home. Each will each generally produce up to 2-3 strong stems with 4-6 flowers per stem. The ideal bloom for making a statement, the stems grow to a height of upto around 50cms (20 inches). 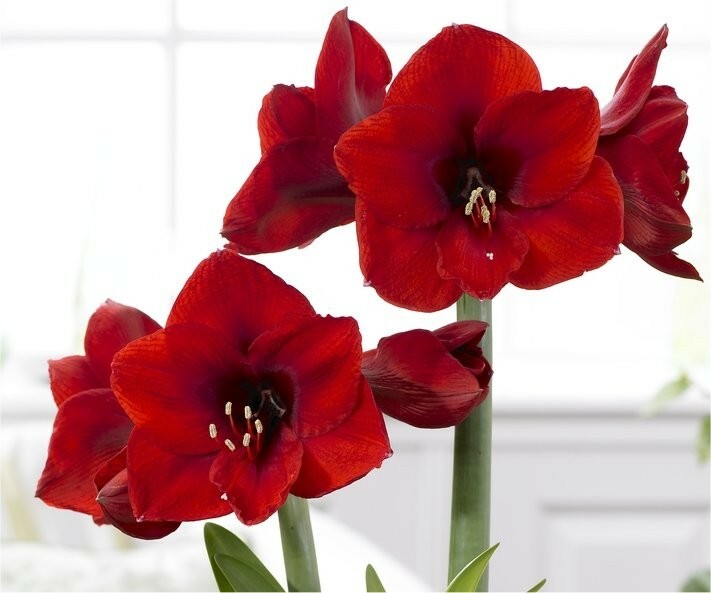 Each of these Red Lion Amaryllis is supplied as a best quality bulb individually gift boxed as standard with full growing instructions. An excellent gift or stocking filler for anyone, our varieties of exotic looking amaryllis, are the best quality available.